The 2009 festival is now complete. Thanks to all our workshop particpants for a great week of music making. This is probably the largest and best group of workshop parcipants that we have had since starting the program. It was a fun week of great music making all around. Special thanks to our Sponsors and volunteers. Without you our program could not run and continue to thrive. Special thanks to Bill Roberts and R&R Music in North Delta for providing us with instruments and a great PA system to use for the week. Thanks to MainRoad Construction and BC Arts Council for your support in this project. Thanks to all of our patrons and volunteers who were there to help us this week financially, as well as move equipment, set up venues, sell tickets, and just be around at events. Thanks to the Corporation of Delta Parks and Recreation for their support with facilities and Craig and the crew at Ladner Community Centre. Thanks to Delta Arts Council for their support with the theatre and especially to Ernie who came to operate sound and lights for us. Thanks to all of our guest artists this week for coming and sharing their art with us, and for graciously working with our workshop participants. Thanks to Dave, Steve, John and Chris for being there for us and making a difference. Thanks to our teaching assistant Chad Leyte for being available this week and helping us out with the workshop. 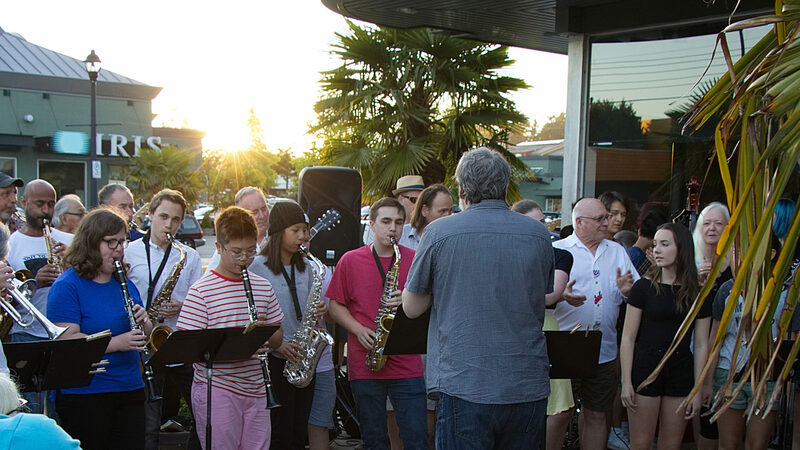 It was great to see so many young musicians turn out to our open jam session at Petra’s in Tsawwassen. Thanks to all of you who took the time to come and enjoy some great music making. In the coming weeks participants will be contacted about sharing photos and mp3’s of some of the performances. There is quite a bit of editing to do but within the next couple of weeks there will be some pictures and sound bytes from the workshop for you to download. From all of us at the workshop, Steve, Jared, Rob, Brad and Stan – Thank You!! July 6 – 10, 2010.